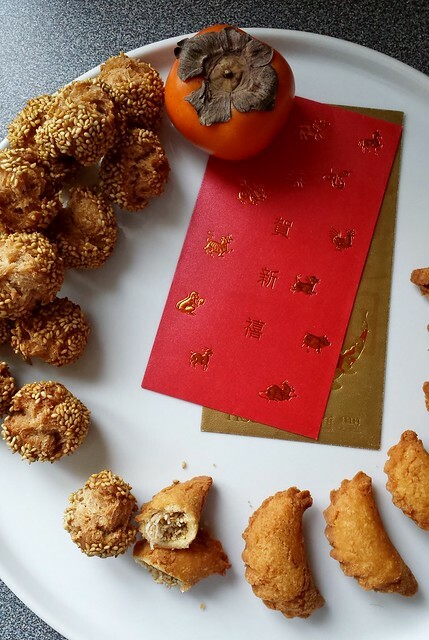 Sesame fritters 笑口棗 literally means grinning fritters in Chinese, named after their signature appearance. 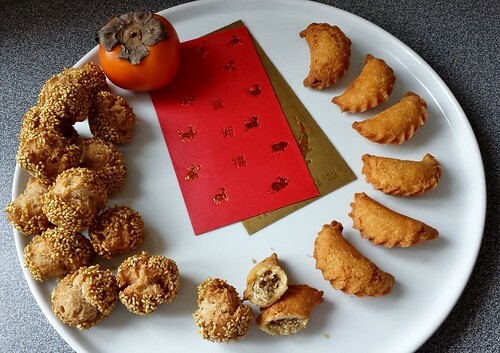 Bite-size pieces of dough were moistened and rolled in sesame seeds before a bath in hot oil. The baking powder leavened dough expanded in the heat to create deep cracks like a grin. I added pumpkin spice to the dough to reflect my western baking experience. The hint of cinnamon, ginger, cardamom, cloves, and allspice was subtle yet it made the fritters so much more interesting. 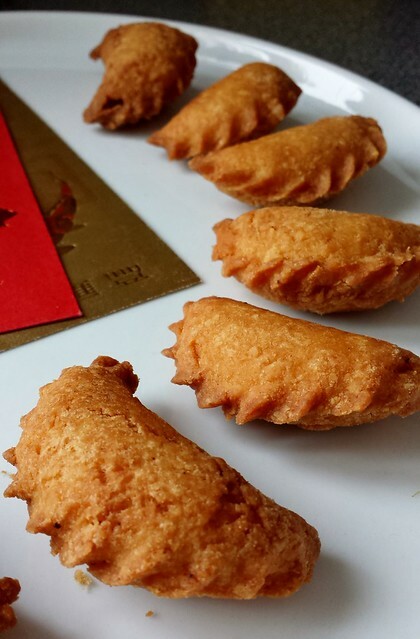 Crispy sweet dumplings 油角 symbolize wealth because of their resemblance to gold nuggets in ancient times. Typical store-bought versions are filled with a mix of peanuts, sesame seeds, coconut, and white sugar. 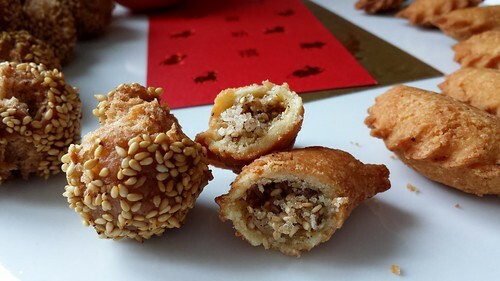 Mine were stuffed with toasted sesame seeds, coconut, raw cane sugar, and fragrant cardamom. The cardamom really added a lovely refreshing flavour you would not expect in these treats! The crust was fussy to work with because the dough was so dry. 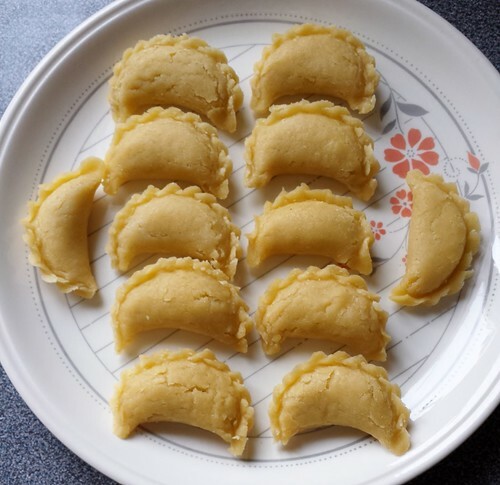 It threatened to crack so I only got a dozen dumplings made. I had no idea how to crimp dumplings but luckily it was intuitive. I simply squeezed the edge to seal then pinched with my thumb and index finger. None of my dumplings exploded in the hot oil, yay me! Whisk together all dry ingredients in a large mixing bowl. Rub in cold butter until crumbly. Toss with cold water until it forms a soft dough. Set aside for 30 minutes. Roll dough into a long rope and cut into 24-28 bite-size pieces. Roll into round balls. 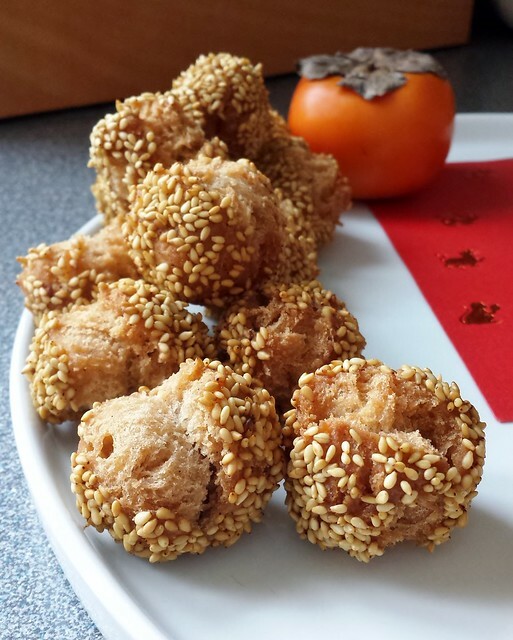 Quickly toss dough balls in a bowl of cold water and coat with sesame seeds. Set on a plate. Heat 1L of peanut oil in a 2 quart saucepan over medium high heat until it reaches 350F. Gently lower half of the dough balls into hot oil. Fry for about 3 minutes until the fritters float to surface and turn gold brown. Drain on several layers of paper towel. Repeat for remaining half of dough balls. Serve warm or store in airtight container for up to 3 days. To make dough for crust: in a large mixing bowl, whisk together flour, sugar, and salt. Rub in cold butter until crumbly. Whisk together oil and egg until homogenous. Add to dry ingredients and knead until it forms into dough. If dough is too sticky, add up 50g of flour until it is no longer tacky. To make filling: toss together sesame seeds, coconut, raw cane sugar, and ground cardamom in a small bowl. Set aside. On a lightly floured surface, roll dough to 1/8” thick. Stamp into 3” circles. Scoop 1/2 teaspoon of filling into dough circle. Fold in half and pinch tightly to seal the edge. Pinch with thumb and index finger to crimp. Repeat until all the dough is formed into dumplings. Heat 1L of peanut oil in a 2 quart saucepan over medium high heat until it reaches 350F. Gently lower 4-5 dumplings into hot oil. Fry for about 2 minutes on each side until dumplings turn gold brown. Drain on several layers of paper towel. Repeat for the remaining dumplings. Serve warm or store in airtight container for up to 3 days.